Employers will be required to submit the data electronically to OSHA, supposedly via a secure website that has not yet been designed. These reports will include an incredible amount of data, including employees’ personal and health-related information. In theory, OSHA would scrub employee-identifying information (but not employer-identifying information), and publish the data online, likely in a manner that is sortable, searchable, filterable, and as embarrassing to employers as possible. the most remarkable data point is the number of detailed incident reports OSHA will receive under the proposed rule — presently, no employer must submit 301 incident reports to OSHA (except by request during an active OSHA inspection), but under the proposed rule, large employers would have to proactively submit approximately 1.3 million 301 reports to OSHA. OSHA does not have the capacity to do anything productive with this data. Such volume for such a small-budget Agency could not possibly be useful in helping OSHA develop policy, target their resources, or implement any program that advances the cause of safety and health. Industry’s Response to the Proposed Rule. The business community has strongly opposed the proposal. Indeed this rule received an extraordinary amount of negative public comment about this proposal. The most common criticisms are summarized below, and here is a link to a set of comments we prepared for a retail trade association about the rule. Significant Burdens for Little Value. In the rulemaking record, OSHA estimated that complying with this rule would require very little additional time and expense, because, the Agency reasoned, employers already maintain injury and illness data, and many employers already use electronic recordkeeping systems. Stakeholders who conducted a thoughtful evaluation of the new burdens reached a very different conclusion. If employers do not currently use an electronic recordkeeping system, they will likely have to adopt some version to readily access the data to submit to OSHA. Even if employers already use an electronic system, they will have to modify it or adopt a new version that “speaks to” OSHA’s reporting website, if that technology will even exist. Otherwise, the new rule will require a tremendous amount of manual data entry and/or duplication of previously entered electronic data. More importantly, any amount of burden is too great if there is no value to OSHA that derives from the data collection. Nowhere in the extensive rulemaking record did OSHA assert that a gap existed in the current data collection regime. The Agency also failed to explain what it intends to do with the additional data. As discussed above, OSHA lacks the capacity to analyze or use the additional data in any meaningful way. Undermines “No-Fault” Recordkeeping Programs. OSHA has expressed that collecting and publishing Injury-and-Illness data will effectively shame employers into eliminating unsafe conditions. From its origins, however, Injury and Illness Recordkeeping was intended to be a no-fault program. Employers and OSHA will have more reliable data if all recordable injuries are chronicled, regardless of cause. Accordingly, the recording criteria do not account at all for cause. An injury is recordable if it meets the regulatory recording criteria, even if the injury was the result entirely of employee misconduct, or defective equipment, or even an act of God. Publicizing the data out of context for the purpose of shaming, however, nullifies the no-fault value of recordkeeping, and wrongly presupposes that all workplace injuries are employers’ fault and/or that employers can prevent all workplace injuries. Likely to Result in Underreporting and Under-recording of Injuries. Stakeholders also emphasized that the proposed rule would dramatically increase the risk of employees underreporting injuries and employers under-recording them. If injury data will be shared with OSHA and the public, essentially in real time, employees will hide injuries to avoid having them publicized, and employers will find ways to keep their numbers down. OSHA hopes that employers will achieve that decrease through enhanced safety programs, but some employers will simply not record all recordable injuries, or at the very least, will take a very conservative approach. Historically, close calls would be recorded, but now, because of the publicity and risk of intervention by OSHA, those close calls will go the other way. Nothing is guaranteed in the context of OSHA rulemaking, but OSHA has identified this rule as a high priority, so it stands a very good chance of becoming law before the end of the Obama Administration. Injury and Illness recordkeeping and injury investigations have historically been an internal affair for employers. 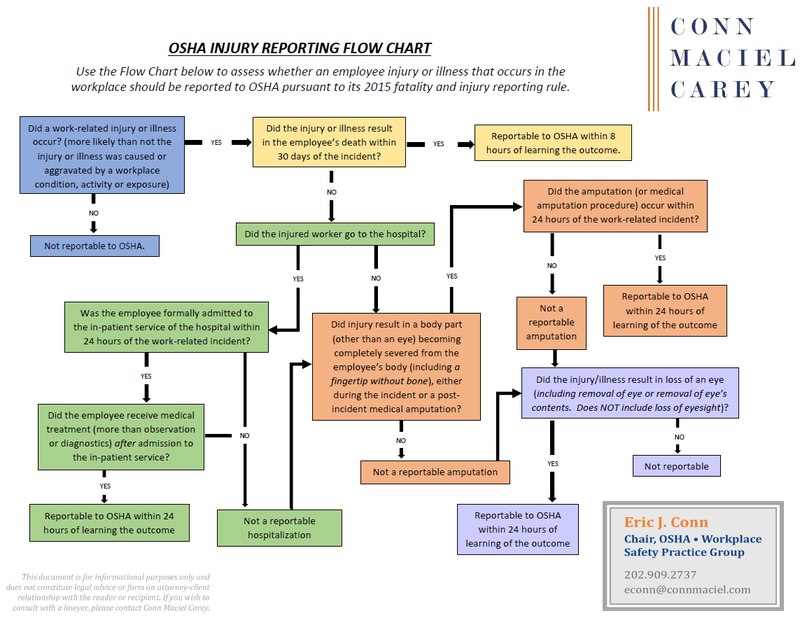 With a significant increase in direct reports of injuries to OSHA in real time and the proposed rule to require periodic submission to OSHA of all recordable injuries will necessarily lead to more frequent enforcement interactions with OSHA. On top of the pending enforcement surge, these changes to OSHA’s recordkeeping and reporting requirements will also negatively impact employers’ reputations through OSHA’s continued deliberate effort to publicly shame employers before any wrongdoing has been found.